Don’t believe their ad campaign. Lexington, Virginia wants you to believe they are not a town where hate has a home. Refusal To Serve Sarah Sanders Ruined Summer Tourism Biz Of Entire Town. Remember when the owner of The Red Hen, a Virginia eatery, kicked Presidential spokeswoman Sarah Huckabee Sanders out of her restaurant last June? Well, three months later tourism in the region is still dead thanks to the Trump-hating restaurant making the area seem uninviting to visitors. And now locals are starting to worry that the Trump haters have destroyed their bread and butter. And so an “emergency” ad campaign to tell you to forget what actually happened, and the hate spewed by one of their marquis businesses, they really want need your money. Thus, the town’s tourism suffered thanks to the angry leftists who has made Lexington look like a bastion of hate. Who wants to go to a town where you might get refused service if they happen to find out you support a politician they don’t like? Who would risk being treated like garbage when you are just trying to relax and enjoy yourself? I don’t think they made it “look like a bastion of hate.” I think they just revealed the true situation to everyone. Don’t click the link; I only include it for completeness. Don’t Get Too Excited About Chicago’s New Black Lesbian Mayor. The piece is full of innuendo, and quotes her opposing campaigns (as if a campaign slogan was FACT). For much of the 56-year-old’s career, she has worked as a lawyer (regularly described as a “wealthy, corporate” one by her opponent on the runoff campaign trail). But the sticking points of the organizers’ contention in Lightfoot’s history has been her roles within the local criminal justice system. In the early 2000s, she was chief administrator of the Chicago Police Department’s Office of Professional Standards, regularly defending the department against external critique. Since it was her job to defend the department, it is hard to criticize her for defending the department. At least all the logical people feel that way. But this is the 21st Century, and logic has nothing to do with anything coming from the Left in general or Out magazine specifically. So is it a problem for a black, lesbian lawyer to take a job working for the police department? If the police department had no black, lesbian lawyers, I’m sure they would be charged with discrimination. I suppose the Left thinks she should have taken the job, and the refused to do the job. Or something. It is just funny to me, to see the Left consuming itself. Because if you disagree with ANY of her policies, you must be RACIST. Ocasio-Cortez Blames ‘Far-Right’ Conspiracies for Destroying Her Credibility. The fact that she preaches communism, shouldn’t matter. The fact that her proposal would cost 93 TRILLION dollars shouldn’t matter. If you were not a RACIST you would support her. Or something. OK, I’m not that Shocked. Patronage – hiring people who help you out politically, or the relatives of those people – has long tradition in Chicago. Toni Preckwinkle hired the children of politicians, former aldermen, Daley and Madigan workers — despite her pledge to end patronage. Then there is Smollett. Chicago police files on Jussie Smollett investigation show behind-the-scenes maneuvers. You expected Justice? In Chicago? You’re not paying attention. The statistics on corruption are staggering. Another Chicago alderman pleads guilty to corruption charges. South Side Ald. Willie Cochran pleaded guilty March 21 to felony wire fraud for spending his ward’s charity funds on personal expenses. That’s 30 Chicago aldermen convicted of corruption since 1972. So another corrupt politician from Chicago? Meh. I was talking with a friend about the current state of the stock market. And in particular, the insanity in late December over the sell-off. See the image for an overview. (Clicking on it will enlarge the view, as always.) More on the image in a bit. But of course the Left and the media (but I repeat myself) were HOPING for a stock market collapse. Because they were hoping that it would help them take out Trump. Now we may be at the start of a Bear Market, or we may be near the end of a correction. But I guarantee that no one in the media knows what is coming next. If they could predict the future, they would have make a fortune already and be sitting on a beach somewhere. But let’s take a look at the December insanity. I could make that list much longer of course, but you get the point. One of the other sources I reviewed for that list (I forget which) said something like “It’s been a party for 5 years on the stock market.” Which is pretty much true, and it is why when November’s downturn hit, (Now is a good time to view that image) everyone who manages their own portfolio, and every financial planner and fund manager started looking at the question, “Are there any stocks where I want to take my profits?” and in mid-to-late December the question became “Is there anywhere I want to take a loss for tax purposes?” You know (or maybe you don’t), capital gains taxes also talk about capital losses. 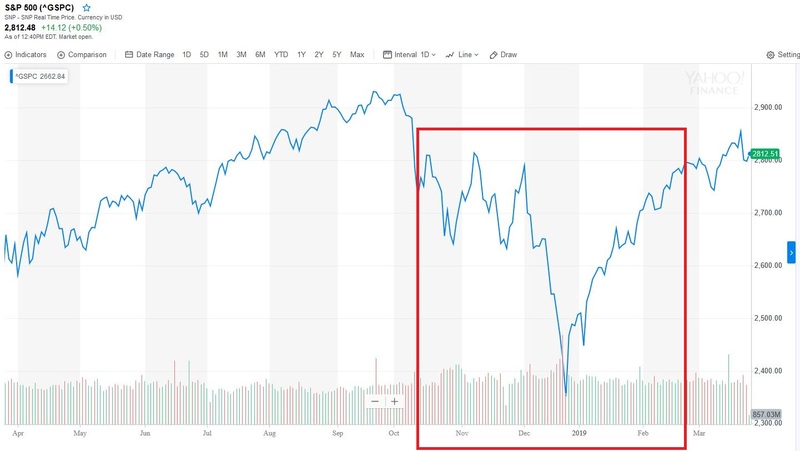 But of course 99.9 percent of the coverage the stock market in December and January, wasn’t about informing the investing public, it was about destroying Trump, because even by December the “Russia! Russia! Russia!” attacks weren’t looking so good. As I said at the start, I don’t know if this is the start of a bear market, or the end of a correction. When I look at things like housing sales and freight numbers, things look good to me, but I can’t predict the future. The point is, neither can any of the talking heads on the 24 hour news cycle. This article has some info about the fallout of the power outage. Infrastructure crisis looms in Venezuela. First up there is some info about the agricultural sector in the country. Word from the countryside is that farmers have been unable to find seeds and fertilizer. And the planting season is about to start. Everyone from Wall Street analysts to Rodríguez, who has sold carrots, parsley, bananas and garlic here for decades, worries that this will be the year Venezuela’s agricultural sector collapses. When Venezuela had 5 days without power, 4.4 million pounds of meat spoiled. No electricity. No refrigeration. Also no water pumping equipment. As power shut down, the country’s aluminum industry was further crippled: Molten metal solidified and destroyed machinery. When power was restored, leaping voltage burned out computers, air-conditioning units and refrigerators. Transformers blew up. Things will get a lot worse before they get better.